Firstly, I must thank Audiobook Jukebox and Recorded Books, Inc for sending a copy of This Must Be The Place. The truth is that while I didn’t give the novel 5 stars, I do feel better having read it. At the very least, this audiobook introduced me to the incredible talent that is Maggie O’Farrell. I’m not sure how her novels have escaped my attention thus far, but that is definitely going to be remedied moving forward. I could not get enough of the words of this novel. They slid through the air like butter, painting exquisite pictures of people, pain, love, and a remarkable countryside. I often found myself happily lost in the complexity of O’Farrell’s writing. There are certain authors whose mastery of the English language is so complete, that they seem to climb into the seat next to you to share their tales. This author is one of those talented writers. Daniel now ranks among my favorite literary protagonists when it comes to dry wit. On several occasions, I found myself laughing out loud at his musings. His observations cut through the noise, and his sharp tongue was something to be marveled. The only things that matched his sardonic delivery were his intelligence and his affection for his family. My only wish was that he narrated the entire book. When the chapters popped around to different viewpoints, I found myself growing impatient as I waited for Daniel to return. If a character is that wonderful, they should get the opportunity to run with the entire story. I’m afraid that this is where the overall rating lost a star. The constant shifts in time, place and viewpoints distracted from the arc of the plot. I would start each new chapter with a bit of a grimace as it always took a moment or two to regain my footing. This is a shame, because the story had so much to share. An incredible amount of emotion was wrapped up in these characters, and their individual stories were strong enough to carry separate books. The trouble with this is, when you have so many compelling lines, each one competes for your attention. While the overall message of the story reached me loud and clear, the disjointed nature of the chapters took away from the punchline. This audiobook was narrated by Graham Rowat and Saskia Maarleveld. Each of these talented voices was wonderful in their own right, but I have to confess that Graham Rowat stole my heart. His version of Daniel Sullivan was perfection. Each time he delivered another tight-lipped sarcastic quip, I swooned just a little more. There’s no question that the voice talents of this audiobook added a great deal of depth and humanity to the story. Beautifully done! Here’s one more quick observation: I don’t typically read romantic novels. I didn’t realize that’s largely what this was until I became invested in the characters. Interestingly, as it turns out, a great way to share a romantic plot is to delve into the psyche of the couple. It was fascinating to see how affection could grow from seemingly benign details, like showing interest in a child’s stutter. Those moments are what make this novel special. In this sense, this novel is a terrific example of how to write a love story. 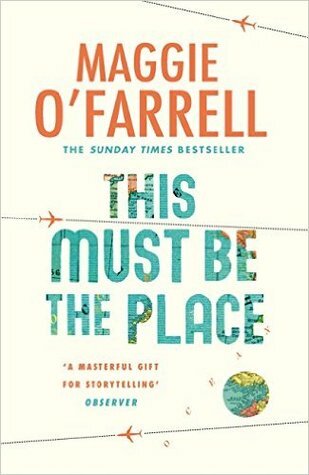 4 stars for This Must Be The Place, and a commitment to read more of Maggie O’Farrell in the future.